You know when you get an idea and a light goes on in your head and you think – why did it take me so long to see this? Well this has just happened to me – last weekend I was looking at the stitched ceramic dishes I had made for the Museum Mending project and thought – why don’t I just stitch these images onto cloth? The mottoes, the hearts, the hands….all these relate to my personal project Make It Through the Night so why don’t I include these into this? DUH! 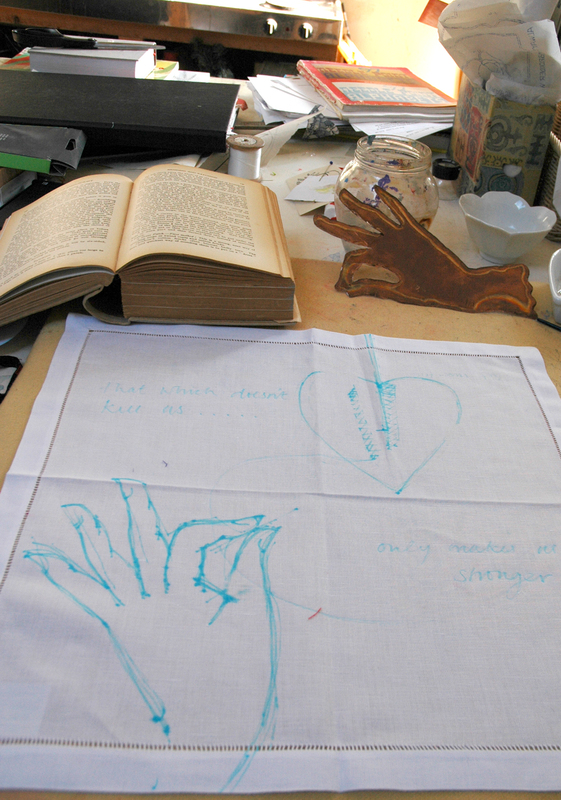 I have done all the research, found the mending mottoes and sorted out the drawings of the hands, but what will I stitch them onto? Well when you are broken- hearted what do need to mop up the tears – a handkerchief – which is a ready- made square of cotton or linen – perfect. 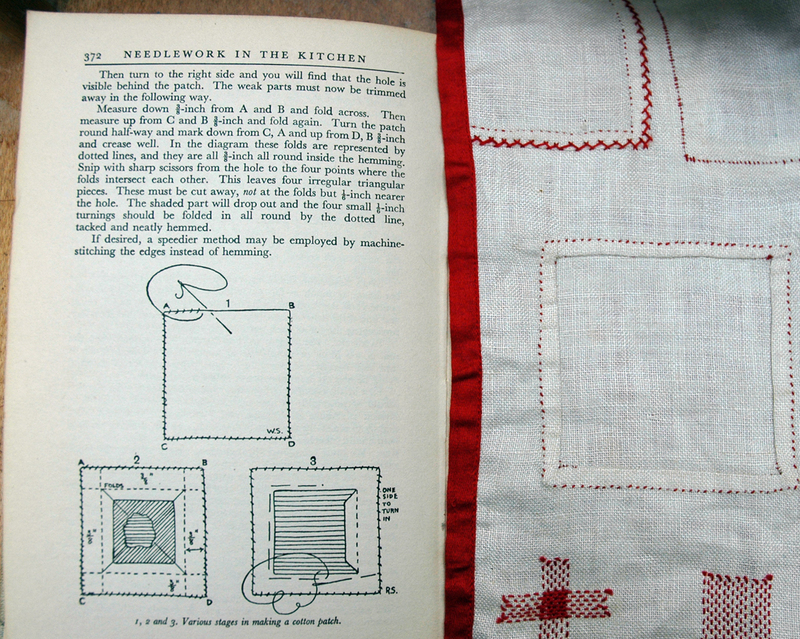 And when I looked through my white fabric stash I found a packet of 4 table napkins left over from another project – hem stitched in linen – perfect. I always take these pieces of luck as a sign that I am on the right track. 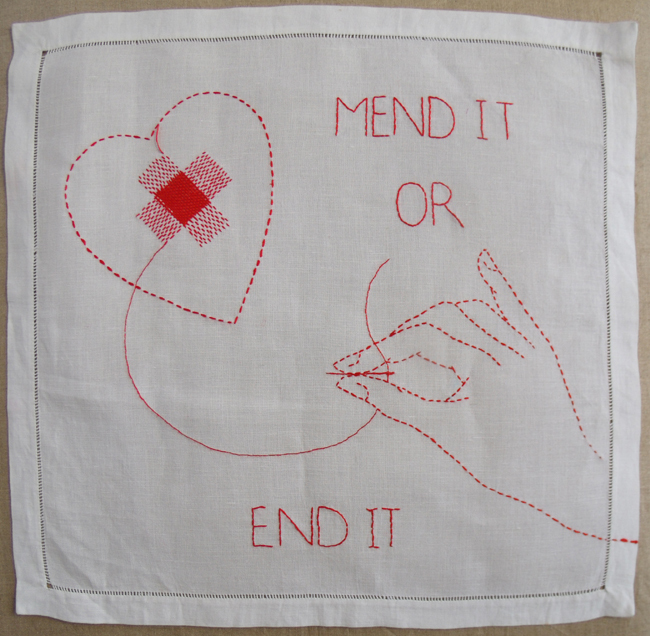 I thought I should try to match the mends with the mottoes and to use the broken and mended heart as a link to the Counterpane/Counterpain embroidery which features in the Make It Through the Night project in Work in Progress section of the blog. I decided to keep the same stitching techniques and colour. 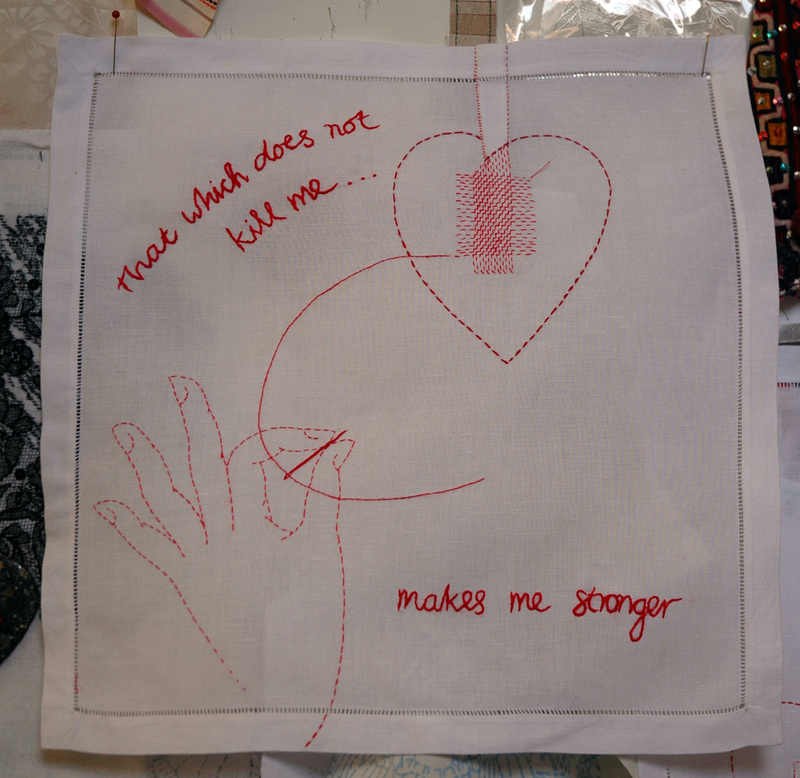 I started with a cut and darned heart, which would need considerable strengthening at the edge of the handkerchief, so the motto had to be ” that which does not kill you makes you stronger” a proverb that I think has a stoical attitude. 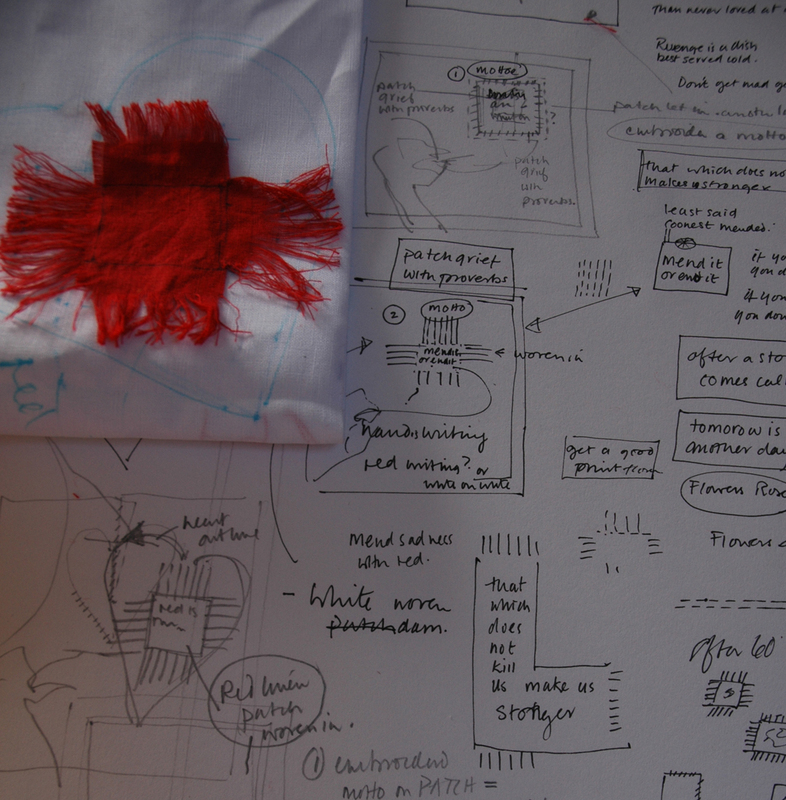 Having drawn out my design and checked the correct darning system in an old sewing manual, and taking courage into both hands, I cut from the edge of the handkerchief straight into the heart, tacked a run and fell seam and set to work sewing it. I chose to sew it in red thread as in the little household sewing sampler that I had bought years ago from an Oxfam shop. It is probably from middle of the 20th century and made as part of an infant school sewing class. 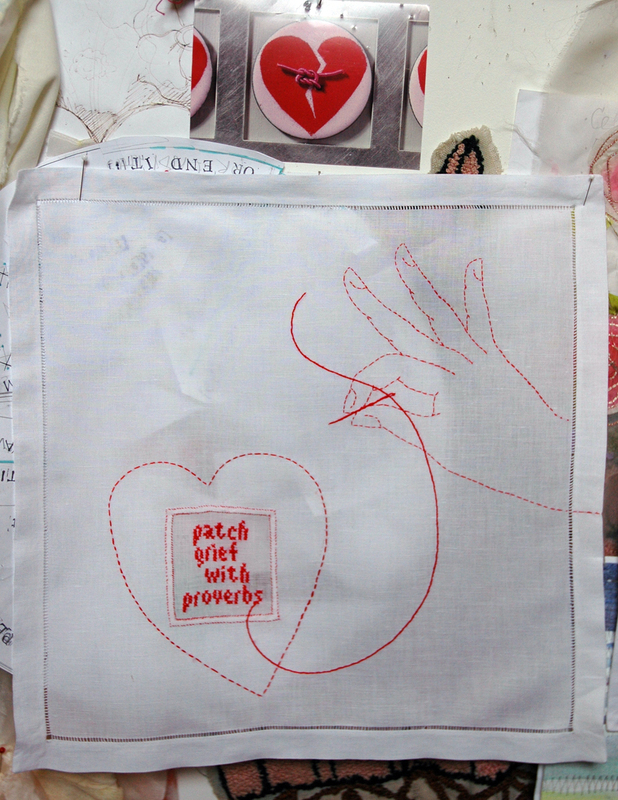 The choice of red for stitching is a swine as every single stitch glows out whether rightly or wrongly placed, I started to dislike the original needlework teacher – why impose this on to your pupils? – well discipline of course….and suddenly my little basic sewing sampler looked like the work of a consumate needlewoman – poor girl – unlike me she didn’t choose to do it. 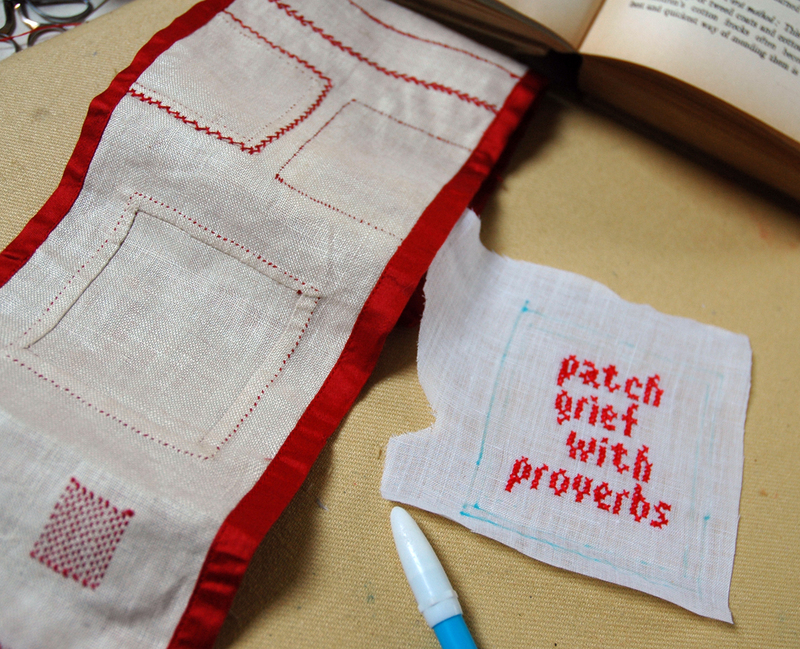 I found the motto, ” Red is the ultimate cure for sadness” and decided to use a patching system using a scrap of scarlet linen, I withdrew the threads and darned them onto the heart. Easy Peasy it wasn’t! withdrawing the threads from the red patch. 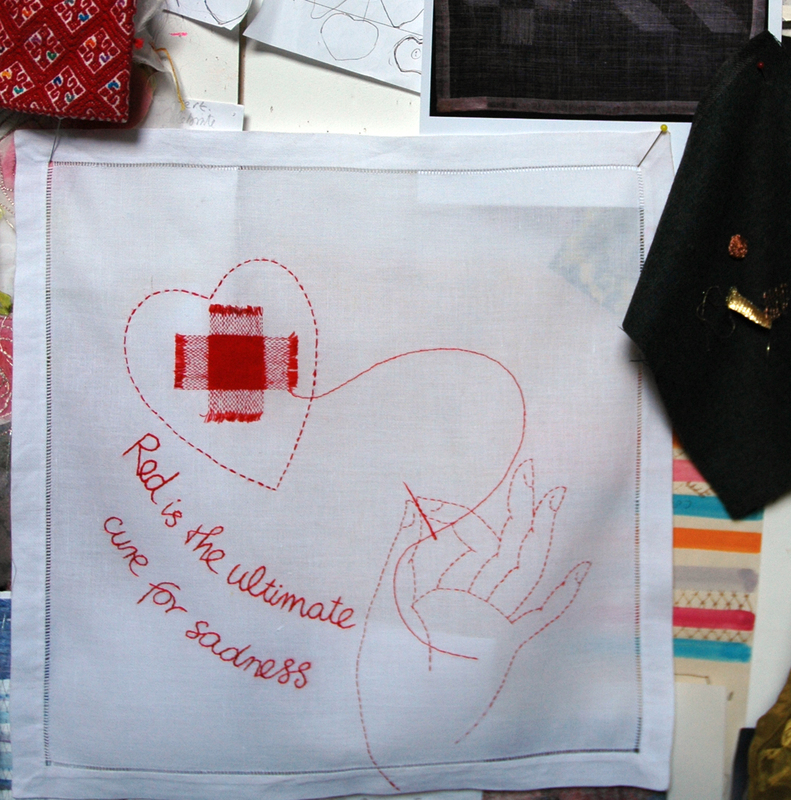 The finished red darning piece can be seen pinned to my studio wall, to the side of it can be seen a sample of Darning as Jewellry by Dail Behennah. 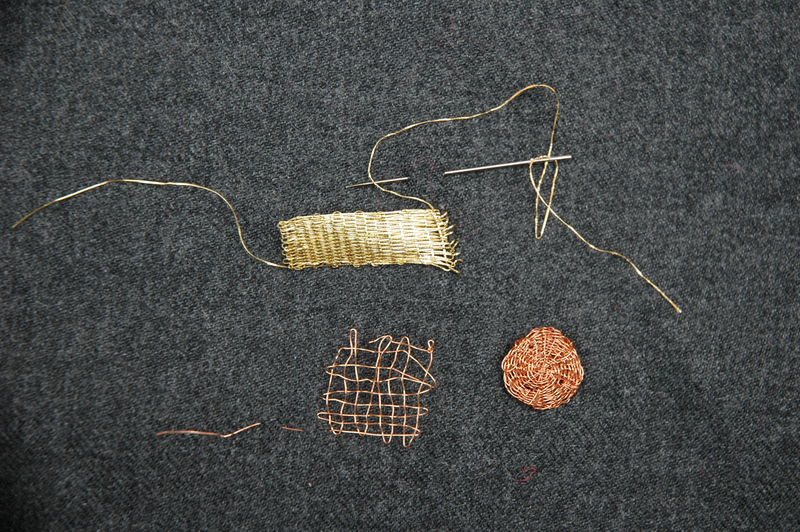 The next piece was also patched, much simpler this time a basic inset patch of fine linen. 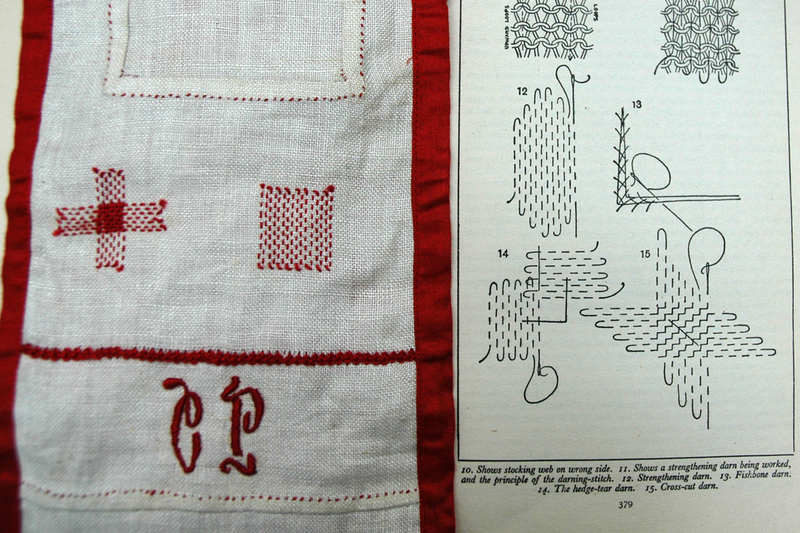 For this handkerchief I decided to cross stitch the motto onto the patch beforehand, and on the left can be seen the embroidered patch prior to cutting and inserting it onto the heart on the handkerchief, below. The image of the small pink and red broken and mended heart pinned above the handkerchief below is a photograph of a set of 50 enamel badges I made for an ETC project several years ago. Maybe I should make some more? By the time I got around to stitching the 4th mending motto I thought Mend It or End It was a suitable finish to this series, the finished piece is the seen at the head of this blog, simple and effective the simple cross – way darn also makes a good warning symbol to make your mind up – the type of real advice my friends actually do give me when I am dithering about anything…I think these mending mottoes will lead to other handkerchiefs, I particularly like the one about the colour Red, I wonder what other mottoes there are about colours? 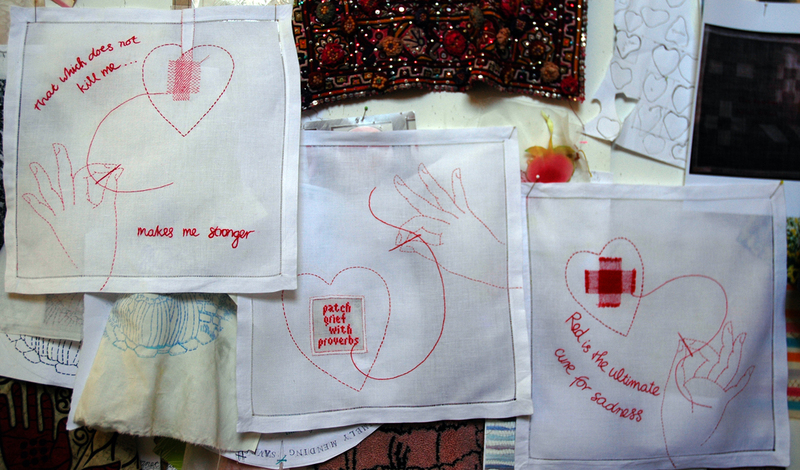 first 3 mending mottoes handkerchiefs on my studio wall. 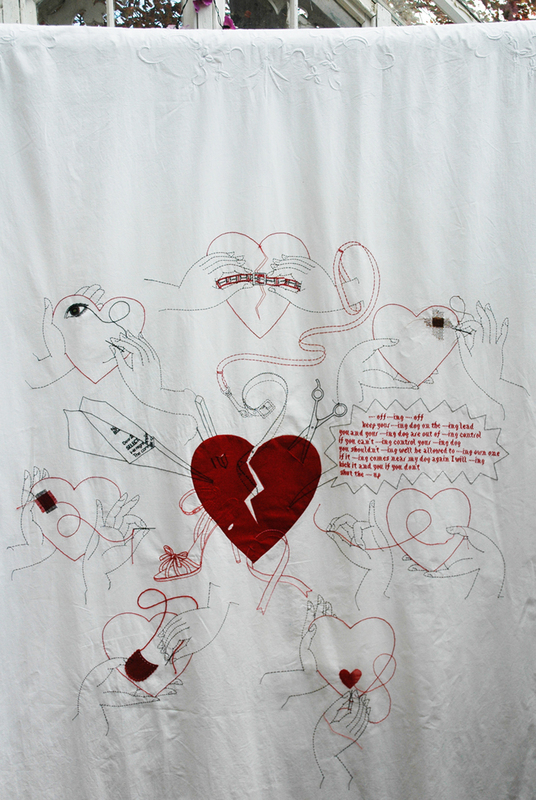 Categories: Drawing, Hearts, Make - Do and Mend, Make It Through The Night | Permalink. But yours aren’t sad, at all!!! And I’m amazed by that you both had the same idea (well, in general) and how different yours attempts are. That’s the power of art and artists!